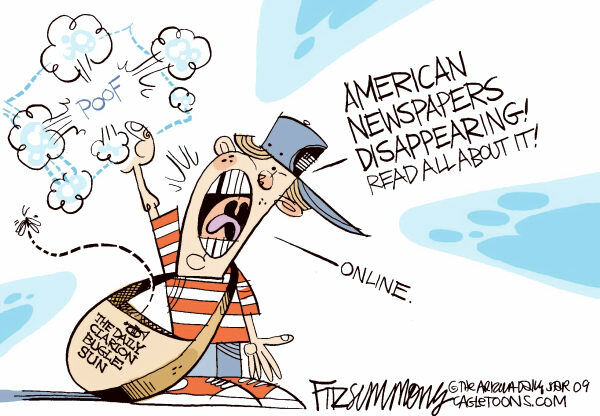 One of the most notorious issues known to the blogosphere today is the “death of the newspaper,” as portrayed in Scott Fitzsimmons’ comic—even the paperboy is turning to the Internet for news! It’s no secret that the Internet, from Twitter to Google News, is demolishing print media. As seen in this article from the Economist, Philip Meyer, in his book The Vanishing Newspaper, predicts that newspapers will completely die in the year 2043 and that the Internet will take over as the main medium for transmitting news. Maybe his book was written a while ago, but in my opinion, the newspaper will die much faster with the rate that technology is currently advancing. In 2010, the United States journalism industry lost jobs three times faster than the economy’s average industry, according to the US Bureau of Labor statistics. The monthly rate of job loss in the journalism industry was reported to be 22.23 percent compared to the economy’s average of 8.1 percent. Catholic online reports that since 2009, 166 US newspaper companies either went out of business, or stopped printing newspapers. On a lighter note, they report that online news jobs are growing at a fast pace which shows that although print media is dying, journalism is not. Older generations today still hold onto their print newspapers, while our generation, and even our parents’ generation is turning more and more to online newspapers, blogs and social media sites for news. This decrease in demand for print newspapers have caused major newspaper companies to suffer. Almost all profits made by these companies in the past have been made off of print advertising and print newspaper sales. As the age of print newspaper dies, these companies have to conform and evolve to the demands of mainstream America. The New York Times recently erected a pay-wall in which visitors are able to see 20 articles a month free, but after that are required to elect one of their many monthly subscription plans. The New York Times, like almost all major newspaper companies, have been forced to charge their readers to read online content due to the fact that they have lost such a significant amount of their profit, which has always been print advertising, to the Internet. Creating the pay-wall was risky in the beginning, but has proven thus far to be a success in creating profits. I believe that death of the print newspaper is inevitable. I also believe, however, that as long as our major news companies evolve with the new age of online news and media, their companies, along with good journalism, will not die. Indeed the trend is that print newspapers disappear, but I think this has nothing to influence the quality of journalism. I accidentally published this post and I’m not finished writing yet. Stay tuned for the finished blog.